An internet cable is seen at a server room in this picture illustration taken in Warsaw. The underwater cable system that provides Internet connectivity for Vietnam, which snapped three times in 2014, was disrupted yet again on Monday morning. The cut was identified at around 8:04 am on the section S1H, which connects the Vietnamese coastal city of Vung Tau and Hong Kong, of the AAG (Asia Gateway Pacific) cable system. The section S1H is under the management of the Vung Tau station (VTU). The VTU said it is searching for the specific point of fracture in the cable system, whereas local Internet service providers said they have yet to be informed of the cause of the incident. FPT, one of the leading telecom firms in Vietnam, said it is contacting the AAG operator for more detailed information, including the estimated time to repair the break. 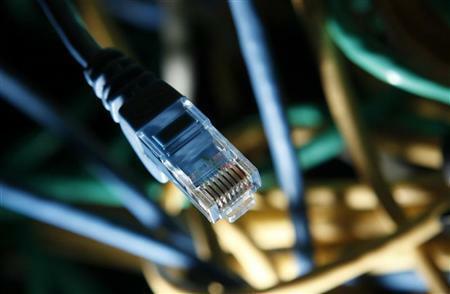 Internet traffic in Vietnam is greatly affected whenever the AAG cable ruptures as the system has the most capacity out of the four submarine Internet cables that provide connectivity for the Southeast Asian country, according to an FPT official. The AAG is a 20,000-kilometer-long submarine communications cable system, connecting Southeast Asia with the U.S. mainland, across the Pacific Ocean via Guam and Hawaii. The cable has encountered frequent breaks and outages since it was completed in late 2009. Last year the cable was cut three times, slowing down Internet speeds when Vietnamese users utilized services hosted overseas. The AAG submarine cable was cut off on July 16, and snapped again on September 15. On September 29, with the second rupture yet to be repaired, a third break was found on the same cable section. This is not to mention the regular maintenance of the system, which lasted between March 2 and 9 the same year. A cut may be caused by sharks or vessels passing the area where the cable is laid, according to insiders.